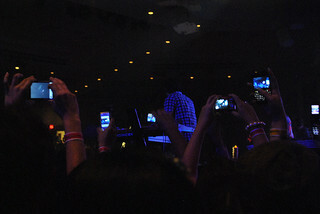 Have you been to a lot of concerts where this is your view? Probably. I’m usually in the photo pit, missing the show because I’m too busy taking pictures. When I’m done I turn around and there’s a sea of cellphone cameras doing the same thing. Why? Didn’t you come to see the show? Anyway, that’s a small point here. The bigger point of this piece is how filmmakers have shaped rock and roll mythology, from Gimme Shelter to Woodstock to whatever your favorite concert movie is.